"I don't think we ever signed a book as quickly as we did Scaredy Squirrel," affirms Karen Boersma, publisher at Kids Can Press. Scaredy Squirrel has turned into a creative and very successful series of picture books by the rising author and illustrator, Melanie Watt. In the existing four "adventures" of Scaredy Squirrel he leaves the nut tree, tries to makes a friend , goes to the beach , and stays up all night . I did say adventures, right? Scaredy Squirrel himself, not the events, provide the drama in these stories. Many things make him very anxious, his imagination impedes rational thought, and he greatly fears the unknown. Just to leave his tree or go to the beach requires lots of planning with maps, action plans, and loads of equipment for Scaredy. Melanie Watt, a trained graphic designer, presents the book in a very unique way with detailed drawings of Scaredy's thoughts, lists, and diagrams as the preparation for the "adventure" unfolds. As in life, things never go as planned, and Scaredy's response is to panic and often avoid the situation completely by playing dead. Scaredy Squirrel is an awesome set of books that should definitely not be avoided. I'm thrilled to know that my name was mentioned in your blog and its a cool coincidence that the next Scaredy Squirrel book coming out in Spring 2011 is about Scaredy's birthday! My memories of birthdays is having my family around me and my mom baking me strawberry pie. I always preferred pies over cake (kind of bizarre, right???) and she would place candles on it. And, I remember having to wait for my birthday present until after we had dessert, which felt like an eternity! My children love reading the Scaredy Squirrel books. I was snooping around the Kids Can Press website and I stumbled upon lots of activities for the books. (I have provided links to all the activities I could find in the "links" section at the end of this post.) We chose to read Scaredy Squirrel at Night and to try the Story Time Activities. In the story, Scaredy plans on staying up all night to avoid potential nightmares. The provided activities suggested to discuss with your children the things they are scared of at night time and what they can do to feel safe. My son talked about how he is scared of monsters. I had him paint a picture of what he sees at night on one side of a piece of paper. I asked him what he does to feel safe and he replied "I go under the covers and talk to my sister". I wrote his response on the other side of the paper and he illustrated it. My daughter talked about the nightmare she had the night before about monsters and how she calls for mom to rub her back and then pulls the covers completely over her body to fall back asleep. This activity was a great suggestion for introducing the book. At the conclusion of reading the book we worked through the provided activity sheets which included a matching game, how to draw Scaredy, and a certificate. After completion my daughter asks, "Can we do the activities for Scaredy Squirrel at the Beach?" There are great activities for that book too. 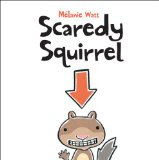 I have only discussed Melanie Watt's Scaredy Squirrel books, but she is not a one trick pony. She is developing another successful series about the self-centered Chester the Cat. Watt's creativity shines through once again in these books as Chester prevents Melanie from writing her book with his infamous "red marker". Chester feels he needs to be the star of the story. He interjects himself and his ideas which leads to Melanie's frustration and ultimately some embarrassment for Chester at the end. But don't worry, Chester gets the last word! Check out the activity links below for third book in the series, Chester's Masterpiece . Melanie Watt never saw herself becoming an author until she published her first book, Leon the Chameleon in 2001, that was created for a class project in graphic design school. Her career has quickly accelerated with the success of her books. Melanie talks often about her personal growth of overcoming her fears and taking more risks in her own life which mirror Scaredy Squirrel. I am looking forward to more of her successes with the upcoming books and the possible production of Scaredy Squirrel TV in 2011. Thank you Melanie Watt for sharing your birthday memory! Good Luck with your upcoming projects! If you have a suggestion for an author birthday celebration, click here. Ahhh...Thank you so much for picking one that I suggested! We LOVE Scaredy Squirrel in our home and I'm positive my son's childhood would be very different without him. The activities on the Kids Can Press site are some of the best for a children's book that I have used. Just love it! And YAY! A new Scaredy adventure, we can't wait! Definitely going on the wishlist. And I love it, pies! So original. My hubby would love it, because he's just not a cake kind of guy. Thank you thank you! Loved this! We are loving these books. I will need to go check out those activities. I had never heard of Scaredy Squirrel before today and then it pops up on your blog and my youngest found the show on his iPad. Crazy coincidence?